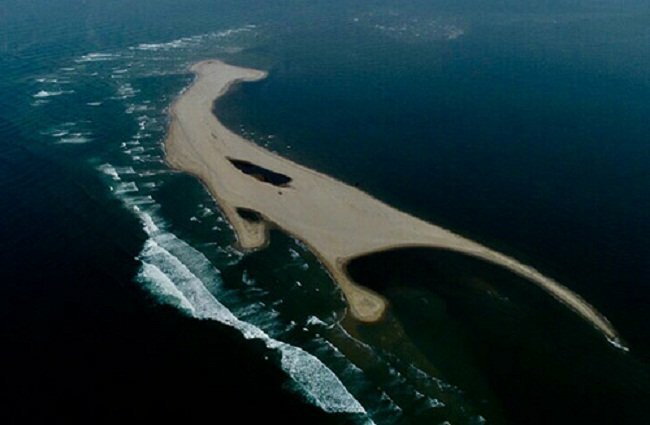 A group of experts from the Ministry of Rural Agriculture and Development is debating whether to keep or remove a 15-hectare sand island that recently emerges around 1.5 kilometers off the coast of Hoi An City in the south-central coastal province of Quang Nam and appears to be enlarging. Nguyen The Hung, vice chairman of Hoi An City, told The Saigon Times that the sand dune is more than one kilometer long, up to 200 meters wide and some two meters above sea level. “This natural dune was formed in mid-2018,” he said, adding that the widening dune might connect to the mainland at the end of this year. “Small dunes appearing and then disappearing at sea are no longer strange due to the rise and fall of the tides and the changes in currents. However, it is unusual for a large dune to emerge and it has the likelihood of reaching the mainland,” he noted. The dune may be the result of sand erosion from the tip of Cua Dai Beach in recent times, according to Le Tri Thanh, vice chairman of the People’s Committee of Quang Nam Province. The provincial leader then relayed the viewpoint of Tran Quang Hoai, head of the Vietnam Disaster Management Authority, stating that their experts have put forward two plans to deal with the dune. The dune can be kept as a breakwater to reduce the current erosion at Cua Dai Beach. If this option is chosen, waterway transport plans will be taken into account to prevent possible accidents. Alternatively, the dune can be destroyed and its sand returned to the beach. “We will carry out scientific research before making the final choice,” he said. An elderly French couple vacationing at the Victoria Hoi An Beach Resort told The Saigon Times this morning, April 8, that if the sand dune is reinforced and aligned with the mainland, it will become a tourist destination that surpasses Indonesia’s Bali or Thailand’s Phuket. Once a large dune emerges, it does not disappear quickly, according to vice chairman Hung. The province is home to various rivers and springs, especially the 10,000-square-kilometer-wide Vu Gia-Thu Bon river basin. When flowing into the sea, the river mouths of the water basin are likely to trigger erosion and soil aggregation, which prevents floods from abating.